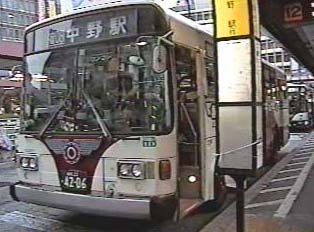 Buses are used to travel to areas where the trains do not go. Sometimes bus routes offer a shortcut between two points that by train would take longer to reach. The fare is paid inside the bus, either before or after the ride. Although buses are generally punctual, they are subject to traffic delays in a way trains are not. Buses only run until around midnight, thus it is important to be aware of the schedule of one's particular bus. 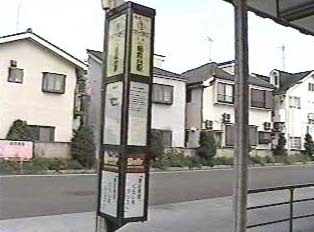 Schedules are displayed on rectangular posts at every bus stop. 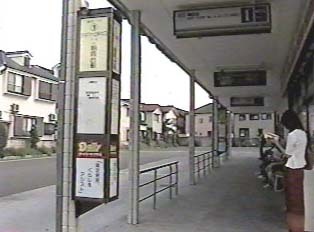 "strip of multiple local bus tickets"
These bus stop signs show bus schedules and destinations, and light up after dark for the passenger's convenience. The destination is on the front of the bus.